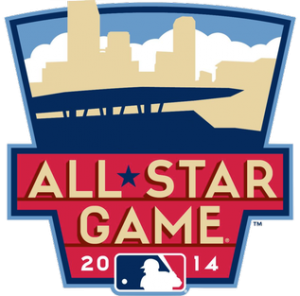 [Today kicks off a big week in our home base of Minnesota as Major League Baseball’s All Star Game, and corresponding festivities, blow into town. This is exciting, both because the eyes of the world will be trained on our backyard, but also because WaterFilters.NET has a unique connection to this game. 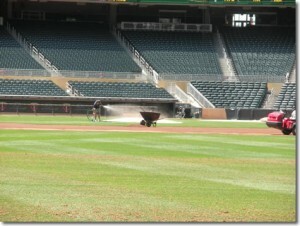 When the Minnesota Twins built Target Field, they built what is still the most sustainable ballpark in the league, due in large part to a custom Rain Water Recycle System provided by Pentair. Pentair, a Minneapolis, MN-based company, just happens to be one of our strategic partners – and we are happy to carry several of their commercial and residential Pentek filtration products. 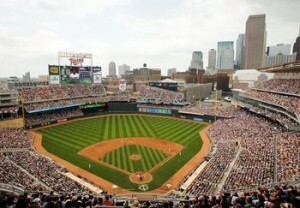 Since its inaugural season in 2010, Target Field’s focus on water sustainability has helped it become a mainstay on lists sharing the most energy efficient baseball stadiums and Major League Baseball’s greenest parks. 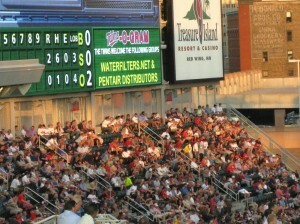 Through a custom-designed Rain Water Recycle System provided by Minneapolis-based Pentair, the Minnesota Twins have captured, purified and reused more than 1,846,322 total gallons of rainwater, drastically reducing the use of municipal water at Target Field in 2011 and 2012. The majority of the recycled rainwater was used to wash down the seating bowl attached to the main concourse. If the infield at Target Field was a six-foot-deep swimming pool, we could fill it four times with the water saved just in 2012. When any new stadium is built, especially in Minnesota it seems, there are typically years of infighting regarding whether or not it’s right to spend tax dollars on playgrounds for billionaires. Without coming down on either side of that debate, what the Twins have done with this public investment is provide a large scale model of green construction and clean water sustainability. The financial sources that brought this stadium to life, for better or worse, created more than just a ballpark. Downtown Minneapolis is home to proof points supporting clean water sustainability best practices that can be applied to future stadiums, individual home owners seeking more effective ways to reduce water usage and costs – and anyone seeking creative solutions for ending our global water shortage crisis. Whether you are a fan of baseball or not, our jewel of a ballpark is an ideal starting point for any conversation centered on creating a more sustainable world. I encourage you to learn more about the clean water sustainability and green initiatives that have helped Target Field become the first professional sports facility to receive LEED (Leadership in Energy & Environmental Design) Silver Certification for both construction and operations at the Minnesota Twins website. I also invite you to subscribe to this blog or our YouTube channel, like us on Facebook or follow us on Twitter to stay up to date on all the latest clean water sustainability news and hydration tips. I also invite you to +1 us on Google+ to be the first to learn about exclusive deals and new products. Many cities throughout the world should be using this practice, as many cities that are often in drought get a lot of rainwater during the year. Having a simple water filtration system to filter this water could solve many problems, especially for the state of New Mexico. They have been in a drought all year, but had some heavy rains, and with systems like this in place, could have avoided it all.